In January we observe both the Feast of the Confession of Saint Peter and the Feast of the Conversion of Saint Paul. 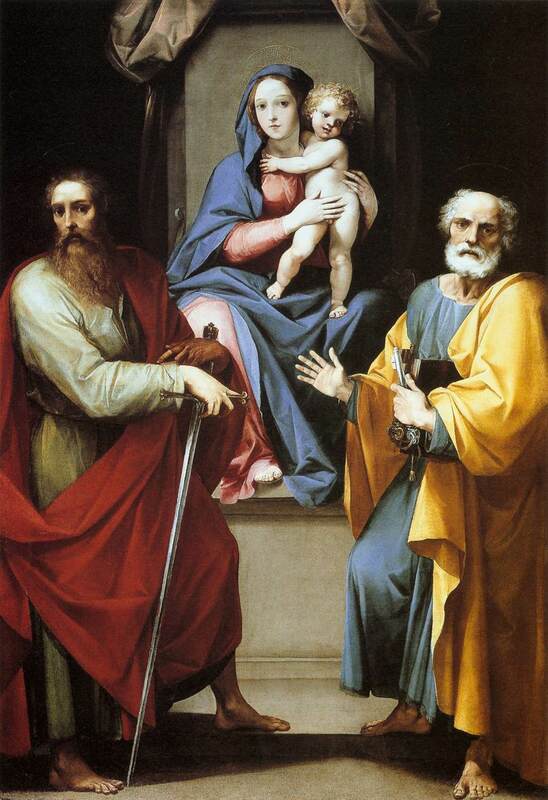 Then, at the end of June, we also observe the Feast of Saints Peter and Paul. What is the difference? Why are there two feasts in January and then the one in the Summer? The January commemorations recall profound and life-changing events in the lives of these two mighty men of God. The observance in the Summer commemorates their martyrdoms. It is not really remarkable that these two saints worked so well together. One would expect that two Apostles would be able to accomplish incredible feats for the Kingdom of God when they put their heads together. It is not remarkable, that is, until you realize how catastrophic was their dispute a few years previously. After the death of Saint Stephen, when many of the Christians in Jerusalem scattered abroad to avoid persecution, St. Peter was summoned to preach to Cornelius the Centurion, a gentile. When Cornelius and his household accepted Jesus as the Messiah, the Holy Spirit fell upon them and St. Peter declared, “Can anyone forbid water, that these should not be baptized who have received the Holy Spirit just as we have?” (Acts 10:47) Similarly, when ordained by the elders at Antioch, Saints Paul and Barnabas, along with Saint Mark, began what has become known as the First Missionary Journey. When rejected by the Jews in Antioch in Pisidia (in Asia Minor), the Apostles declared, “We turn to the Gentiles” and quoted the Prophet Isaiah we he declared, “I have set you as a light to the Gentiles, that you should be for salvation to the ends of the earth.” (Acts 13:46-47) The remainder of the First Missionary Journey is filled with accounts of gentiles becoming Christians. Thus, Saints Peter and Paul were on the same page when it came to whether or not the Gentiles could become followers of Christ. There is no record that either Apostle attempted to make their new-found converts adhere to the Law of Moses. So when the two men found themselves together at the Council of Jerusalem (ca. 50AD), each man only affirmed the testimony of the other. Upon hearing the testimony of Saints Peter and Paul, Saint James the Just, the brother of Jesus, as the first bishop and ruling elder of Jerusalem, came to the conclusion that gentile converts to Christianity need not follow all of the Law of Moses. Instead, they would only need “to abstain from things polluted by idols, from sexual immorality, from things strangled, and from blood.” (Acts 15:20) The gathered assembly agreed with this decree and a letter conveying this message was sent to Antioch with Saints Paul and Barnabas as well as Barsabas and Silas, two men from Jerusalem. 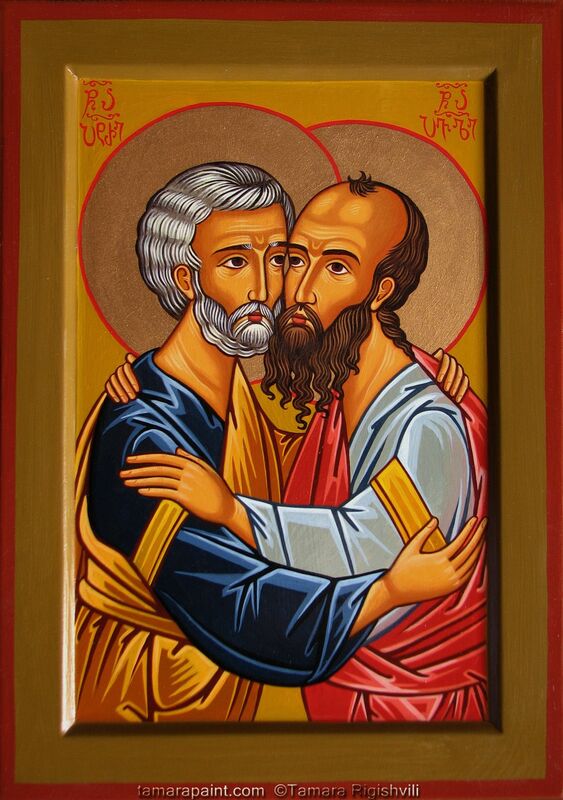 According to Acts of the Apostles, there was never a conflict between Saints Peter and Paul and the subsequent conflict between Saints Paul and Barnabas arose over the issue of whether to take Saint Mark, who had failed them previously, along on their second missionary journey together. That, however, is not the same story which St. Paul himself reveals in his Epistle to the Galatians. St. Paul gives an account of just how articulately he presented his argument against St. Peter in the remainder of the second chapter of the Epistle to the Galatians, but never recalls the outcome of the conflict. We do know this, however: Saints Paul and Barnabas split up after this encounter and never went on another missionary journey together and St. Paul left Antioch and returned only briefly once more (Acts 18:22). On the other hand, Eusebius, as well as other sources, records that St. Peter ministered in Antioch for quite some time before moving on through Corinth to Rome, and regards him as the first Bishop of Antioch. Neither history nor Holy Scripture record the specific details of the disagreement between the two Apostles. Neither history nor Holy Scripture record the specific details of the reconciliation of the two Apostles, but we do know that they were reconciled and they that they served the Lord God mightily together in both Corinth and in Rome. We also know that, within a few months of each other, they each went to a martyr’s death under the Emperor Nero, St. Paul being beheaded while St. Peter was crucified upside down. In its inability to inform us history teaches us another lesson. The fight is not nearly as important as the reconciliation. The issues that drive us apart are not nearly as important as the work that we can accomplish together for the Kingdom of God. May we, like Saints Peter and Paul, have the grace to lay aside our differences, forgive the wounds of the past, and work together to further the Gospel of Our Lord Jesus Christ. Almighty God, whose blessed apostles Peter and Paul glorified you by their martyrdom: Grant that your Church, instructed by their teaching and example, and knit together in unity by your Spirit, may ever stand firm upon the one foundation, which is Jesus Christ our Lord; who lives and reigns with you, in the unity of the Holy Spirit, one God, for ever and ever. Amen. Jewish tradition observes Peter’s death on Tevet 9 and Paul’s execution on Tammuz 29. What is “conversion to Judaism” if it is not beginning to follow the Torah? What Jews observe the deaths of Christians whom they would have considered apostates? Conversion to Judaism involves, among other things, ritual washing or cleansing and, of course, circumcision. Paul was vehemently opposed to requiring the conversion of gentiles to Judaism before they could be saved. That was what his entire letter to the Galatians was about and it is the only issue that the Jerusalem council was dealing with in Acts 15. It was decided, Luke tells us, that gentiles would not be required to convert. The four requirements that the council decided had to be met by gentiles would allow Jewish believers to fraternize with gentile believers without becoming ritually unclean. Apparently many Jewish believers would still not eat with gentiles, if they did not know exactly how the food had been prepared, for fear of eating or touching something unclean. This was the issue at play in Paul’s reference to Peter’s hypocrisy in Galatians 2. Peter and Paul were both Torah observant Jews until the day they died and Messianic Jews consider the Apostolic Writings (they don’t use the terms Old and New Testament) to be Scripture. The Torah was not done away with. In fact, Acts 15:21 implies that the gentiles in question were already observing the laws of Moses. There was huge conflict between the true apostles and Paul. James the just particularly. People need to investigate themselves to find “Veritas”. “Veritas” is, of course, the Latin word for Truth, but when you say, “there was a huge conflict between the true apostles and Paul,” do you mean to imply that Paul was not an apostle or a “true” apostle? What are you suggesting?